Add the Amish Monterey Master Dresser to your bedroom furniture collection and enjoy an exceptional bedroom dresser that is full of function and style. The master dresser features four spacious bottom drawers, a middle row with lots of room, and four smaller drawers along the top. 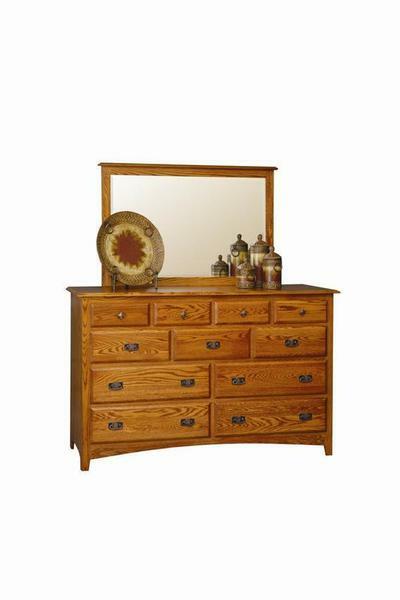 Use this Amish made dresser in your master bedroom or guest room. Store foldable clothing items as well as accessories and cosmetics in the smaller drawers. The large drawers provide ample room for blankets and linens as well. Customize this Amish dresser in your choice of solid wood and stain. Add the beautiful mirror and enjoy this combination to use as you get ready for an evening out. The spacious surface allows room for your jewelry box, family photos and more. Take a look at the Amish Monterey Double Dresser for a smaller version of this Amish bedroom dresser. This bedroom furniture is Amish made in America, ensuring that it is built to be strong and durable. Enjoy this solid wood dresser for years to come. Call us with any questions, toll-free at 866-272-6773. We are always happy to help.